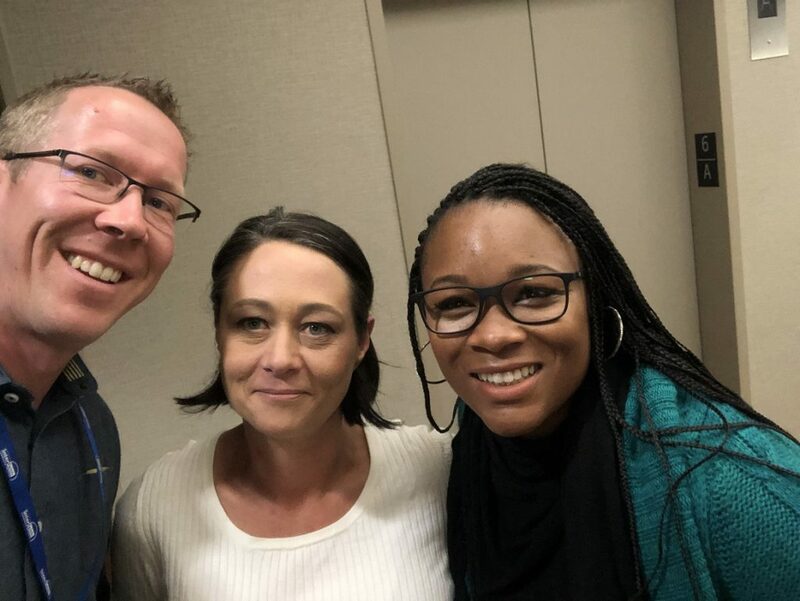 On this episode of ‘Homeless in San Diego: Real People, Real Stories,’ host Greg Anglea, CEO of Interfaith Community Services invited Housing Case Manager Tierra Bowen alongside her client to discuss her journey from the streets to stability. Brie recently attended the National Alliance of Ending Homelessness Conference and won a highly competitive scholarship due to her amazing rehabilitation story. She has come a long way since being a resident at Interfaith. Eviction, debt, and a criminal record with multiple violations are just a few of the barriers Brie had to overcome in order to be where she is now. After 6 months of looking for housing without any luck, Brie was living in a safe house with her 5 year old daughter. She was unable to find housing due to being rejected by landlords because of her background. Interfaith owns 80 apartments on 1 block of Escondido. They are used to help stabilize people and support reunified families who find themselves in a similar situation as Brie. Through this program, Interfaith was able to provide Brie with 18 months of stability. The beginning of Brie’s story began when she was 14 years old, the age she became aware that she suffered from depression. At 16 years old, Brie made her first suicide attempt and has since been hospitalized over 20 times throughout her life. She also found herself in between long term and short term facilities to receive care. Brie is now 41 and has not been hospitalized for over 4 years. She shared that she had endured a lot of trauma from the domestic violence that lead to her divorce. This is when she had begun using methamphetamine to cope. Brie blames her drug abuse as a secondary illness and her mental health was the first problem. She tried many different types of medications and avenues of therapy, but she felt that drugs supplied her with a unique ability to cope in the moment. Once her addiction got out of control, Brie lost everything; her home, children, and from there, she ended up on the street. Anglea wanted to address the common misconceptions that surround addiction in order to promote a deeper awareness toward people experiencing homelessness. He asked, “Why can’t you just stop?” regarding her drug abuse problem. Brie was able to get clean, address some of the mental health issues she had struggled with, and eventually was approved by the courts to reunite with her daughter. But her perseverance coupled with the unconditional support of caring caseworkers helped her accomplish all that she has. She utilized what’s known as “Harm Reduction Therapy” to address her mental health and drug addiction problem. Brie originally couldn’t get clean or off of the drugs because she wasn’t finding the right help. Harm Reduction Therapy does not require sobriety to treat mental health issues. Brie was able to receive treatment while intoxicated. UCSD allowed her to walk into the program without strict expectations and she was accepted with open arms. Brie felt loved, encouraged, and lifted up until her spirit was strong enough to feel ready to quit. She expressed gratitude for people like Tierra Bowen who held her accountable throughout her journey to stabilization and rehabilitation. They asked questions regarding her visitation with doctors, gave her regular goals, and helped pull her through by not giving up on her. Throughout the show, they discussed the complex processes involved from the start to finish process of rehabilitation. Bowen shared that it’s not just about getting a housing voucher, but the support system and other community partners to help create stability for families. This is evident in Brie’s story. Brie has renewed her bond with her mother and son, her record is expunged, and she is two classes away from getting her A.A. degree in sociology. She is nearly 4 years sober and therapy professionals deemed that her mental health symptoms are in remission. Currently, Brie is living in permanent housing. She also volunteers and works with parents experiencing homelessness that are trying to reunite with their children. Brie’s resilience, strength, and appreciation for all of the people involved throughout her self-improvement journey makes her truly inspirational. Anglea said he looks forward to working with Brie in the future as a colleague; Brie has aspirations to be a social worker and give back to the community once she earns her Master’s degree. Pay equitable wages for the social work that’s being done or increase wages. Continue to donate. Even the smallest donation can have a large impact. Check out the Adopt a Family Program during the holidays. Make donations to the food pantry year round. If you or someone you know is experiencing substance abuse, check out the Harm Reduction Therapy at UCSD.